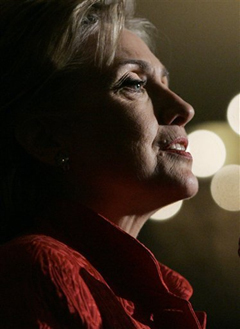 It has officially gotten a lot worse for Senator Hillary Clinton’s Campaign. The word coming from the New York Times and the Associated Press is that Clinton is now trailing Senator Barack Obama in superdelegate totals and it looks like there might be no end to the bleeding. In truth, this is the time that the superdelegates have been waiting for. Without a true winner in the past few months many of them were not willing to stick their neck out to shift the balance in favor of one candidate or the other. Obama’s recent North Carolina win last week, and the media coronation that followed, has assured any undecided super-d that the danger of declaring their allegiance too early has clearly passed. Obama’s latest superdelegate pick-ups have now given him a lead in every measurable category over Hillary Clinton. 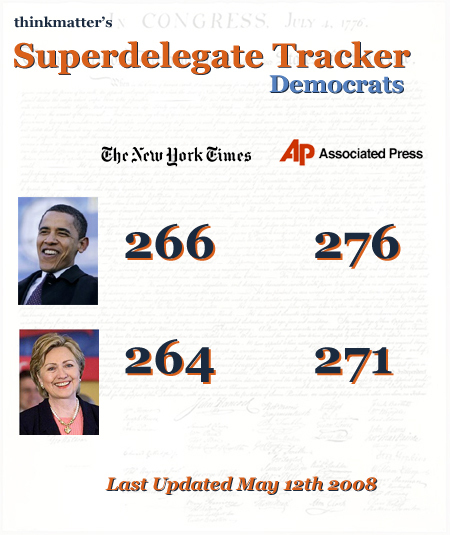 As a result, one could easily envision a scenario in which Obama surges ahead in collecting superdelegates and claims the 2,025 total delegates/superdelegates he needs to clinch the nomination. Those super-d’s who have decided to declare for Obama post-Indiana/North Carolina were, in all likelihood, simply waiting for an opportunity like this to present itself. I doubt that many will follow suit, but enough may that it could render the remaining primaries moot (perhaps even more so than they already are). Though I will offer a word of warning here. As much as I have dedicated a lot of space to analyzing the faulty arithmetic that has led Senator Clinton into her own electoral quagmire, I have recently come to believe that keeping Hillary in the race might have a silver lining. The current state of affairs, despite how important you may think it is for the Democrats to start the healing process, is actually beneficial to the Democratic Party. Dan Balz said it best last week when he mentioned the incredible success that the Dems are having in registering new party members and organically growing new campaign organizers. As soon as this history-making race went past Iowa and New Hampshire, voters for Hillary and Barack invested themselves even more in their party. The media circus also stirred up interest never before seen in a presidential election, much less a presidential primary season. The Democratic Party has been reeling over the past 20 years. Its non-answer to the Republican marketing and issue machine has left it at an organizational disadvantage and funding disadvantage, which it is finally starting to pull out of. Thanks to a miserable 8 years of President Bush, Democrats are reaping the rewards of public opinion gone sour. For as much as Hillary’s presence in this race is angering Obama supporters, threatening disunity and increasing the potential of alienating independent voters, calling the race because super-d’s flock to Obama’s side will hurt party organizing in the remaining states. Not only will voter’s feel robbed of the opportunity to have their voices heard (and the press will hammer that point home, I can assure you), the Democrats would lose the opportunity to register thousands of Democratic voters and build up an organization that has been lacking in so many ways for so many years. There’s no need to stop this train before it reaches its last stop. Let the last vote be cast in Puerto Rico before we call it quits.